Borobudur is the world’s largest Buddhist temple, built in the 9th century over a period of 75 years, used for scarcely 100 years before being abandoned and rediscovered only in the 1800s. 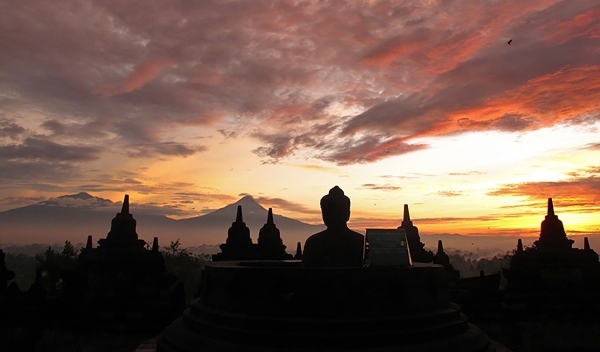 Since an extensive restoration project from 1975-1982, sunrise at Borobudur has become one of Yogyakarta's biggest draws and spectacular events. Borobudur Sunrise moments offers a different experience where participants were given a special pass to enter the temple early in the morning at approximately 04.30 am before public visitors. A 03.30 am from Cavinton Hotel Yogyakarta and takes one-hour drive to the Borobudur temple area, north-west of Yogyakarta. When arrived 04.30 am at Manohara complex, the only hotel near the Borobudur compound, it is still dark. After registration, then you need to walk around 10-15 minutes to the top view of Borobudur to get a spectacular sunrise experience. After climb to the top view of Borobudur, make sure you check your compass in your phone which direction is east so that you won't miss the good spot to take pictures for sunrise moments. A panoramic scenary and a very beautiful morning at Borobudur especially those moments when the sun would appear from the horizon. A truly enlightening experience!